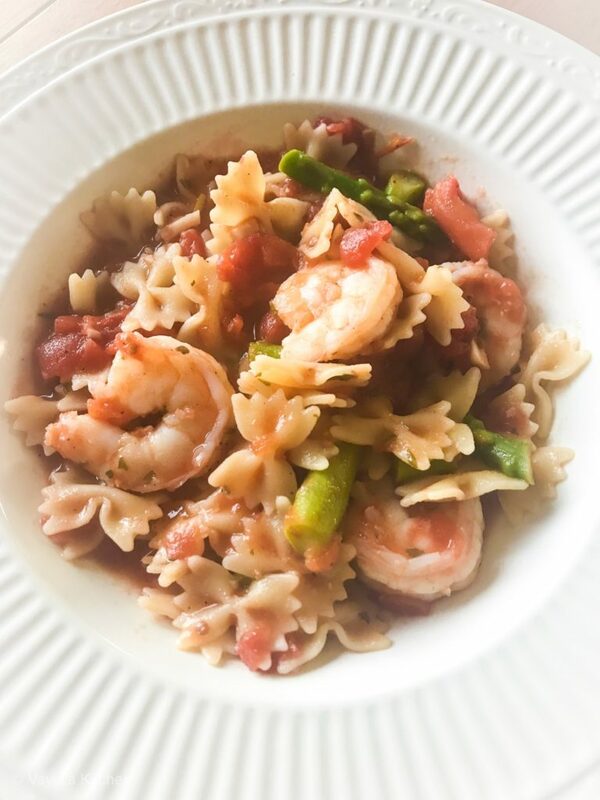 Before I get into the recipe for Shrimp and Asparagus Marinara with Mini Bow Tie Pasta , I have to tell you that I’ve been very lucky to be married to an amazing guy for the past 23 years. One thing I learned early on in my marriage is this: if I want a happy husband, all I need to do is feed him pasta. 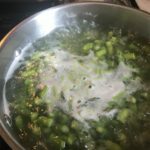 John Skinner, my love: this post is dedicated to you and your love of all things pasta! Do you love shrimp? Asparagus? Pasta? 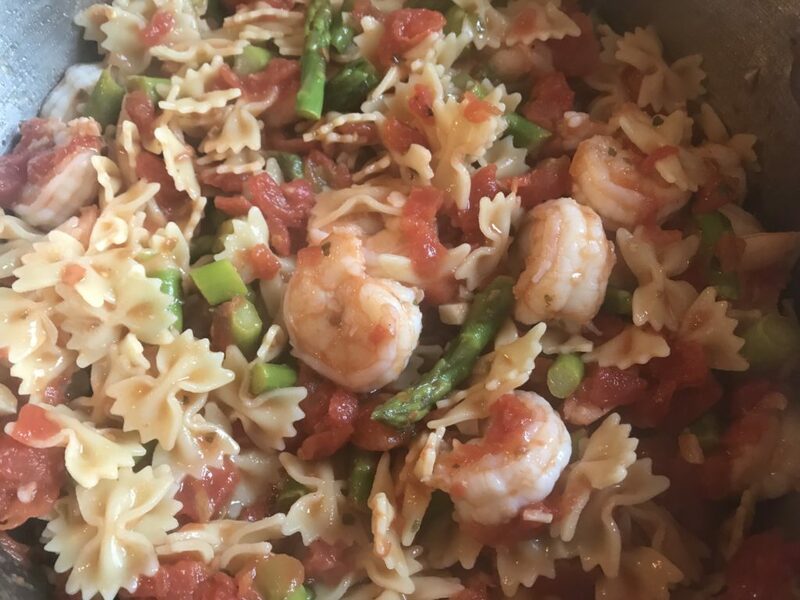 Then Shrimp and Asparagus Marina with Mini Bow Tie Pasta is the dish for you. It checks the box on so many meal requirements. Need a one pot meal that can serve as a weeknight meal? This is it. It’s ready in 30 minutes flat. How about an easy-yet-impressive meal for a Saturday night dinner party? Yup, check! 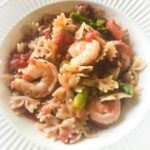 Your guests will be super impressed by the taste combination and the colorful, creative artistry of the red tomatoes, green asparagus, and pink and white flecked shrimp. What about when you need to use up in-season tomatoes? Check, Check, Check! Peel and de-vein your shrimp and set aside in bowl filled with cold water. In a large dutch oven, add water to cook your pasta according to your package directions. But don’t light the fire yet! Wait until you’ve prepared the sauce. In a saucepan on medium-high, add olive oil. Once it heats up, add your chopped garlic. Now this step is key — saute the garlic for about 30 seconds — that’s it! As soon as you smell the garlic, add those tomatoes! Otherwise your sauce will go from sweet and delicious to bitter and nasty quick. Add in a teaspoon of salt and pepper (you can taste again later and add more as necessary). Add in your fresh or dried basil and cover. Bring to a boil. Reduce heat to low and simmer for about 20 minutes. 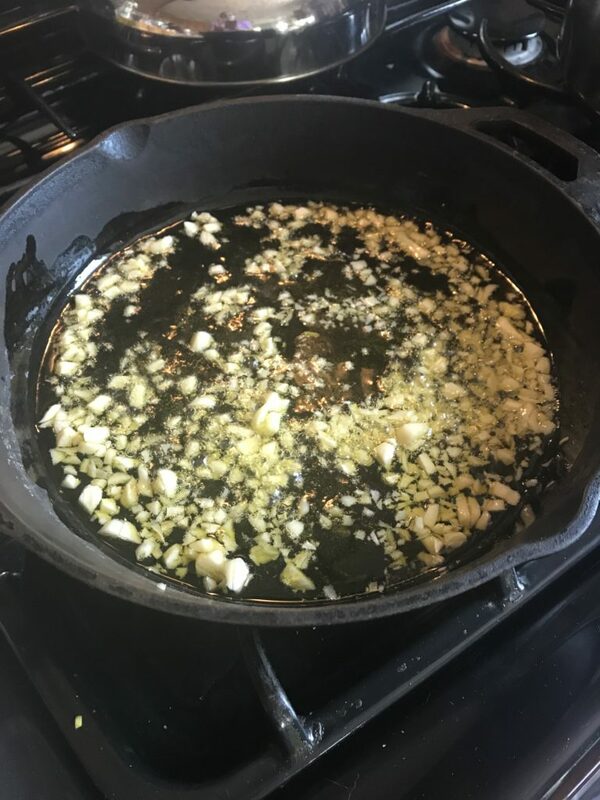 Saute the garlic in olive oil. Now, drain the water from the shrimp and add in an even layer to your sauce. Poke the shrimp down into the sauce, cover again, and let cook for an additional 5 minutes. Shrimp cook fast! The flavor of the sauce will coat the shrimp and make them taste out of this world. Add tomatoes and basil to garlic and simmer for 20 minutes. Meanwhile, as your shrimp begins to cook, add fire to your pasta water and cook pasta according to package instructions. 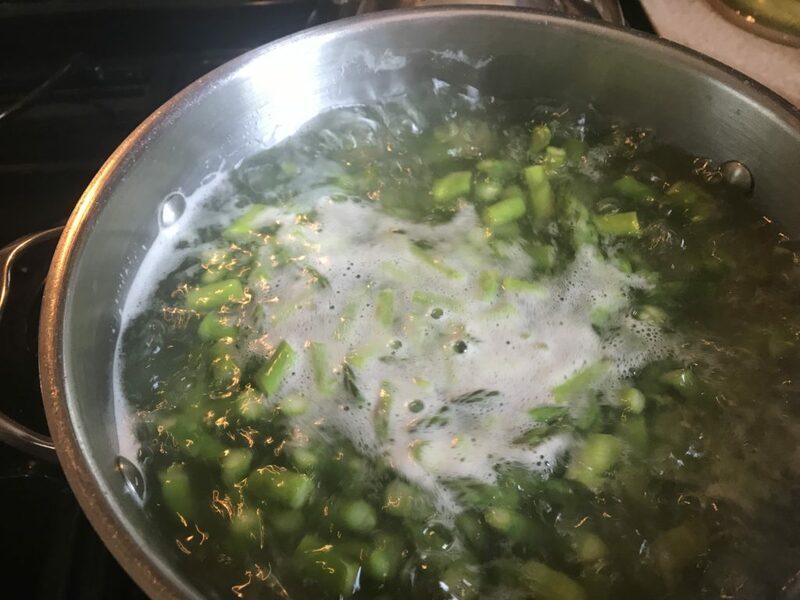 In the last three minutes of cooking, add the asparagus to the pasta water! Boom! Drain in a colander, and return pasta and asparagus back to the pot. 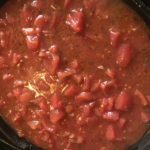 Add your shrimp marinara to the pot and give it a taste. If it needs more salt and pepper, add it in! Taste and repeat until it’s just right. 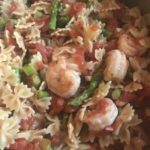 Your shrimp and asparagus marinara with mini bow tie pasta is ready! Easy meal for any night of the week. So right about now most chefs will tell you to add some pretty basil leaves for a garnish and that’s awesome if you’re looking to impress. But in our house, we just plain serve it up and dig in! 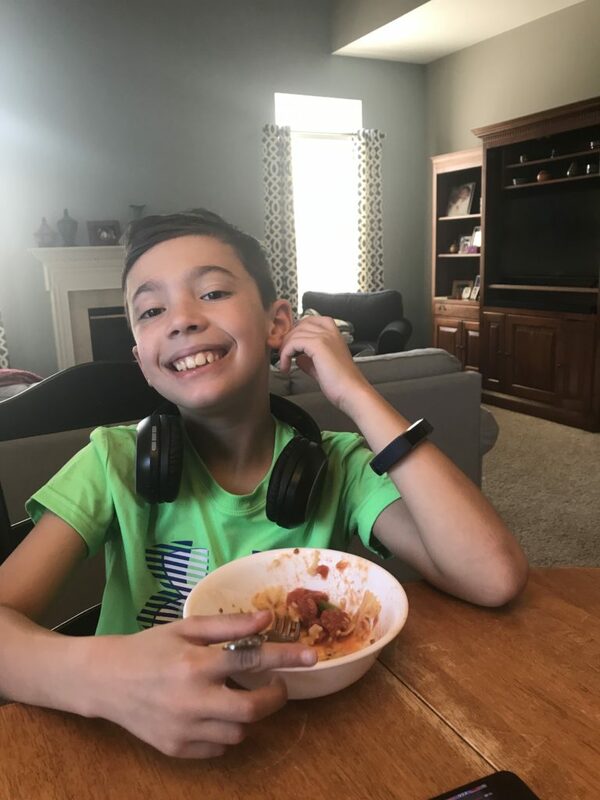 Reilly approves of my shrimp and asparagus marinara with bow ties! 2 lbs. Frozen peeled and deveined shrimp - 21/30 Count you can also use a smaller size shrimp, too! In a large dutch oven, add water to cook your pasta according to your package directions. But don't light the fire yet! Wait until you've prepared the sauce. In a saucepan on medium-high, add olive oil. Once it heats up, add your chopped garlic. Now this step is key -- saute the garlic for about 30 seconds -- that's it! As soon as you smell the garlic, add those tomatoes! Otherwise your sauce will go from sweet and delicious to bitter and nasty quick. Add in a teaspoon of salt and pepper (you can taste again later and add more as necessary). Add in your fresh or dried basil and cover. Bring to a boil. Reduce heat to low and simmer for about 20 minutes. 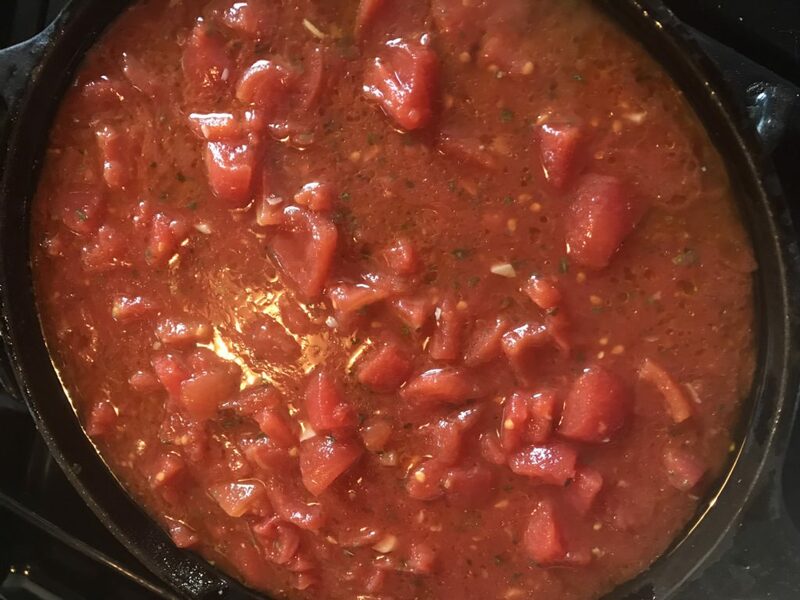 Add your shrimp marinara to the pot and give it a taste. If it needs more salt and pepper, add it in! Taste and repeat until it's just right. 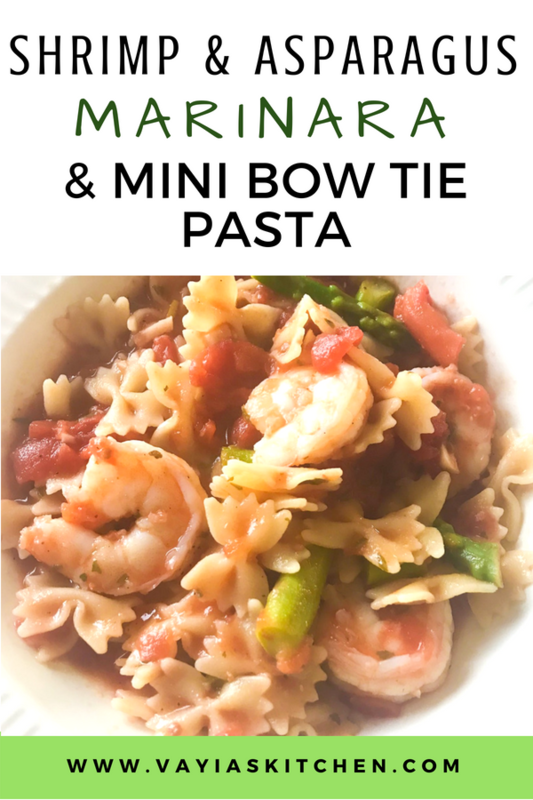 Your shrimp and asparagus marinara with mini bow tie pasta is ready! So right about now most chefs will tell you to add some pretty basil leaves for a garnish and that's awesome if you're looking to impress. But in our house, we just plain serve it up and dig in! Looks yummy and easy – just wondering if I can substitute the pasta for zucchini noodles? Trying to cut down my carbs!! Hi, Nomiki! Absolutely. I love zoodles and substitute frequently. My only suggestion is to NOT combine the zoodles with the shrimp marinara, since zucchini is mostly water and will turn into a mushy texture. Instead, serve the shrimp and asparagus marinara over the zoodles to maintain the crunch and texture we love about zoodles.